Here I go again with another before and after ... no matter how hard I try to blog about all these awesome decorating ideas I have in my head I just never get around to writing about them... someday. So I hope you enjoy these little before and after updates! Here's a quick refresh of a teenage boy's room. I have a client who I adore working with and when she asked me to refresh her son's room I was pretty excited. I'm rarely asked to do a guy's room...I think boys are typically too sloppy or just don't care even the slightest about their surroundings. So... what did we do? We repainted the whole room london fog by Benjamin Moore and added a wall of Thibaut wallpaper to add a little texture/industrial feel to the space. I actually wanted to purchase the faux wood stick on pieces from West Elm but they don't sell them any longer. I know where to source them but frankly I was going to get the same look with this wallpaper -- and it was much easier to apply:) ha! We took down the loft bed and created a custom navy headboard with a gray linen welt (that fit perfectly) to coordinate with this fabulous West Elm bedding and custom pillows. We also placed the bed close to the wall so we could leave some open space in the middle of the room for his friends to hang out on the floor and play xbox. We combined both gray walls and wallpaper with the current beige carpet (which will be changed out at a later date) and beige/white washed modern furniture. The overall feel of the room is kind of beachy/"west-elmy" I purchased a lot of items excluding the furniture from them... we have to get our inspiration from somewhere, right? We didn't spend a whole lot of money yet created a fresh new look for this young teen! I know it's fall and winter is upon us but I thought I would share a project I worked on this summer. It was a beach house built in the early 70's and I don't think much changed in this house until my clients and current owners purchased the home last year. So, a little background on this house-- the owners hired me for a temporary fix. Yep. Temporary. Just to get it up and running and functional for a season or two because they weren't sure if they were going to sell it or tear it down and build new. So as you can imagine it was a VERY tight budget knowing it may not be there next year. And NO new kitchen, NO new bathrooms, NO new window treatments or major renovations of any kind were done and happy to say it turned out so pretty they may keep it longer than expected. AND I think it's a great example of how you don't have to tear these old houses down just spruce them up a bit and they can be so charming! One more interesting fact is the owner grew up coming here as a boy. He knew the family and knew that the house was filled with love and special memories and he wanted to re-create that same feeling for his family. The wall-to-wall carpet was removed. New cypress flooring was bleached to keep it from yellowing and then installed. The dark wood paneling was kept just painted decorators white and all of the trim was painted super white by Benjamin Moore. The red console is from Host Interiors Ardmore, PA and is by Mitchell Gold and Bob Williams. I love this console for tight spaces and trust me it's a great red. The owners weren't sure what to do with the iron railing but I wanted to keep it as is. I love the lines of this railing. They just don't make'em like this anymore. Look how fresh and clean the space looks now. This was sort of an awkward space because to the left of this bench is the entrance to a bedroom. But we added a bench and a few custom pillows. In every project I try to use fabrics and pieces that I've never seen/used before and that have personal meaning to my clients. I usually get tired of seeing the same fabrics and furniture pieces used over again and I don't want my clients house to feel like a furniture showroom, RH or PB or whatever their favorite furniture/accessory store may be. It has less meaning and it would feel like they've seen this before... right? In addition, I always try to include something custom and original in every room to make it special and specific to each homeowner. So as an ode to the owner who is an avid fisherman and boater we added the red Manuel Canovas calypso pillow in red and the navy and white "flagish" looking pillow on the bench. Just enough (I hope) without being too "theme-y"
I also added a large mirror to open the hallway and reflect light from the new door the client added. You can also see the modern flush mount lighting we added in the reflection of this mirror. The new design of this space turned this dark entry into a light-filled fabulous space. The goal was to turn this 70's house into a clean, modern fresh space with clean lines yet keeping it a bit traditional in line with the client's taste. Stay tuned each week as I share the before and after's of this fun, yet budget-minded beach abode! oh and if you want more mind-blowing before and afters on the web check out Calling it Home's One Room Challenge here. This is where talented designers transform one room in six weeks. Enjoy! One Room Challenge: Week Six - The Reveal! for lighting the fire I needed to put this room to bed (so to speak). The mission for the room? To make it fun, colorful and a happy place for an 11 year old girl to wake up in! Fyi - this post will feature mostly the images from my daughter's new space. All links to products and fabrics are at the end of the post. sponsors for making this room look beautiful! - Let them know Stephanie Kraus Designs sent you! I had the pleasure of surprising the teenage daughter of one of my favorite clients with a bedroom makeover. It was going to be a surprise and had to be completed in less than six weeks so no custom furniture or draperies were possible and the budget was going to be tight bc as we know teen girls like to change their mind on a whim! So here are the pics. Next time I'll discuss how I went about the design and some tips on how to get a similar look on your own! Stay tuned for more details in the next post! To purchase a ghost chair with monogram please contact me at kraussteph@yahoo.com! Sharing at Savvy Southern Style! Yep, another mini before and after. PUT THE SPRAY PAINT CAN DOWN NOW!! I'm becoming an addict. But c'mon tell me this lamp doesn't look better than it did before???? For some reason I totally forgot to take a real before picture of this floor lamp which I am sooo guilty of doing on several projects (I'm getting better). So I found this picture of the lamp from like 5 years ago. I purchased it from a store called Scallywags that went out of business like 8 years ago and I paid a pretty penny. Trust me on this. Kind of amazing, right? Doesn't even look like the same lamp, right? I'm also going to divulge two (2) other trade secrets demonstrated in the above photo. 1. A touch of black in every room is a must. A black lampshade with gold lining makes a simple floor lamp look elegant and rich-looking. 2. 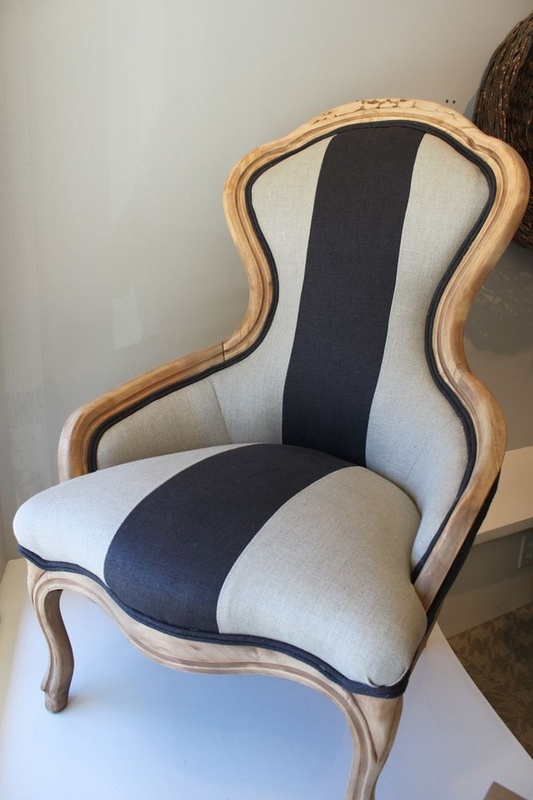 Also, if you have light colored furniture like my blue and white wide-striped slipper chairs from Lee Industries... place a textured throw on them to keep sticky, grimy hands away from them! ha - so there you have it. But until I do ---this works don't ya think? should I just bite the bullet and get the Arteriors lamp for that spot now? -- Please like my page on facebook and tell your friends about this blog and if your feelin' it subscribe to this newsletter via email! AND I'm sharing this post with Kim from Savvy Southern Style!! PLEASE Go check out her blog. Kim has been so supportive of me being a new blogger and all!! Awesome blog you can check it out here! Thanks Marty!! One last most awesome blog .... The Shabby Nest! There's nothing richer than a good classic stripe! Client T (for thoughful) has a dining set that was given to her by her mother. It has sentimental meaning to her and she wants to keep it. I love that about her. Not just because I believe in using what you have, but I think it's so important to have pieces in your house that have special meaning to you. We are in the beginning stages of this design but I thought I'd show you the steps as we move along. The china closet needs to be restyled and so on. But, this client could almost stop here -- looks fresher right? She spent less than $100 on the fabric. Stay tuned for more. Oh, and don't forget to look around your room is there something special to you? Thousands of dollars in designer fabrics, wallpaper, etc. mean nothing if your room doesn't hold meaning to you! Seriously, who is going to let me order these chairs for them? Crazy you say. Crazy like a fox. Let's pair it with a white lacquer table in the kitchen shall we? You can buy them here if interested. I would pop out the great state of PA in a colored denim that is pulled from the room. Red perhaps? Wouldn't it be great if you used your own son/daughter's jeans for this project? Way to recycle. So last week I mentioned this concealer and since then I have run into several peeps who also use this product. Yeah! I love positive reinforcement. Do you remember that I tried to explain the correct way to use it or how to "correctly contour" under the eyes, on the forehead etc.? Well, I did a horrible job -- not my expertise by any stretch. But, I found someone who can help us. Have you ever wondered how the celebrities get that flawless skin look? --- well here is the secret and it doesn't take that long once you master the technique. You may have to modify a bit depending on your skin tone but you can get the general idea. And I know she's a bit west coast and I'm not trying to stir up any Tupac vs. Biggie bad memories here but they can be a bit more bold with their makeup on that coast because they are in the sun everyday. I would use whatever bronzer/concealer you have on hand or if you need to buy new I would highly recommend this duo. It's better for our east coast faces. I hope you found it interesting ... so go play with it! What are you waiting for? If you are looking to freshen up a room in your house for Spring contact me at kraussteph@yahoo.com.